Earnings season kicks off in earnest today, with major U.S. banks – JPMorgan (NYSE:JPM), Wells Fargo (NYSE:WFC) and PNC Financial (NYSE:PNC) – set to get the ball rolling before the opening bell. Dow futures are up 175 points ahead of the Q1 reports, with the S&P 500 and Nasdaq 0.5% higher. In Asia, Japan +0.7%. Hong Kong +0.2%. China flat. India +0.4%. In Europe, at midday, London +0.3%. Paris +0.3%. Frankfurt +0.5%. Futures at 6:20, Dow +0.7%. S&P +0.5%. Nasdaq +0.5%. Crude +1.5% to $64.53. Gold +0.3%to $1297.10. Bitcoin -0.2% to $5069. Scenario 1: IF Bulls hold bid above 2900, THEN initial upside target measures 2906 – 2908.50 zone. Next higher target measures 2911.50 – 2914.50 zone. Scenario 2: IF Bears hold offer below 2900, THEN initial downside target measures 2892.25 – 2889.50 3 Day Central Pivot Zone. Today is Cycle Day 3…Price has rallied in overnight trade and as of this briefing is a whisker within achieving 3 Day Cycle Target Objective 7660.00. 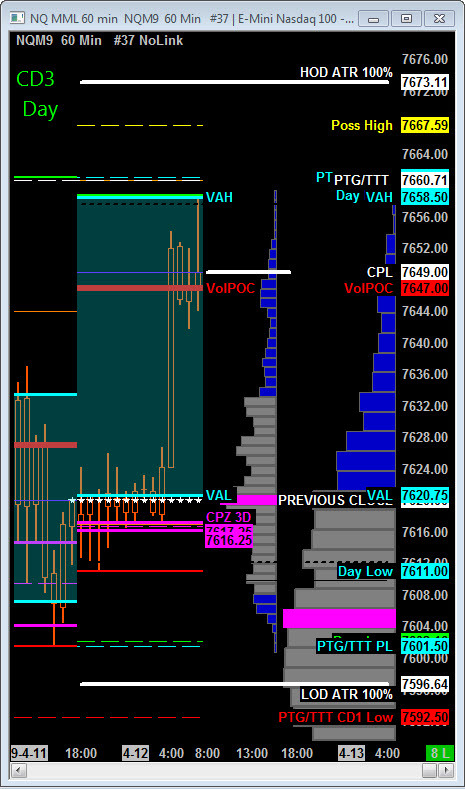 Scenario 1: IF Bulls hold bid above 7620, THEN initial upside potential targets 7660.00 – 7667.50 3 Day Cycle Range High Zone. Scenario 2: IF Bears hold offer below 7620, THEN initial downside targets 7602.25 – 7588.25 CD3 Range Low Zone.